The origami crane is one of the most popular paper folding projects of all time. It is often the project that beginning paper folders want to learn how to make once they decide they are interested in origami. The origami crane motif is so popular that it can be found on paintings, posters, wall decals, trinket boxes, and t-shirts. Some people even get origami crane tattoos to symbolize peace and harmony. To fold a traditional origami crane, you will need a square sheet of origami paper. If you do not have a lot of origami experience, start with larger paper. Smaller sheets are hard to work with because of the detail required in folding the steps of the crane. Origami cranes look pretty folded from patterned paper, but you might find it easier to practice the folding the model with a light colored solid paper first. Sometimes, it can be hard to see the creases when folding dark or busy patterned papers. The crane in this tutorial is made using 8 1/2 inch x 11-inch paper cut into an 8 1/2 inch x 8 1/2 inch square. An origami crane begins with a square base. Place your paper colored side up. Fold in half diagonally and open. Then fold in half along the diagonal the other way. Turn the paper over to the opposite side. Fold the paper in half, crease well and open. Then, fold again in the other direction. Using the creases you have just made, bring the top three corners down towards the bottom of the paper. Flatten the model to complete your square base. 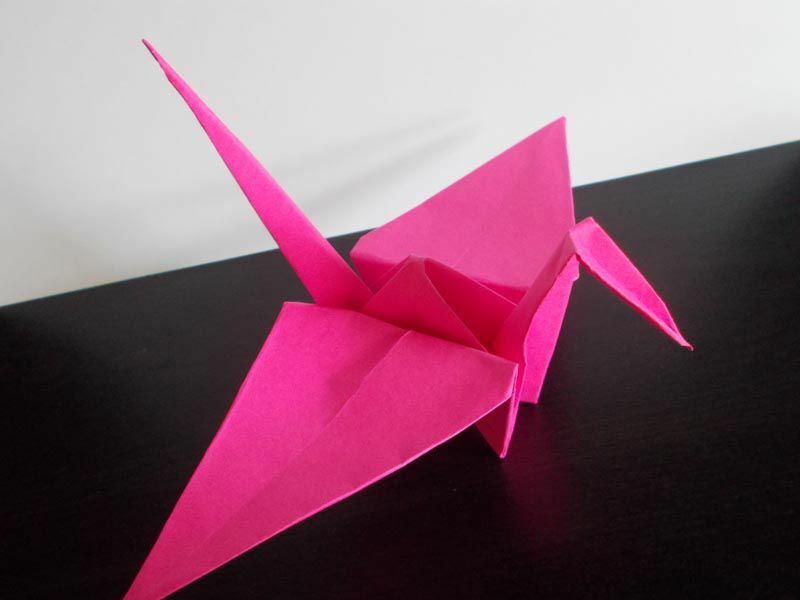 The origami crane is created using a bird base. A bird base is a square base plus two petal folds. To turn your square base into a bird base, fold the top left and right flaps into the center and unfold. Fold the top of the model downwards to create a horizontal fold that connects the diagonal folds you just made. Crease well, and then unfold. When you are finished, your paper should look like the photo to the left. Open the upper flap, pressing the sides of the model inwards at the same time. Flatten down, creasing well. When you are finished, your crane should look like the photo to the left. To complete the bird base, turn the model over and repeat the petal folds in Step 3 and 4 on the other side. Fold top flaps into the center as shown in the photo to the left. Flip your origami crane over, then repeat this step on the other side. Fold both "legs" of your origami crane up as shown in the photo to the left. Unfold. Inside reverse fold the legs along the creases you just made to create a head and tail for your crane. Fold the wings down to complete your origami crane. Once you get proficient at folding origami cranes, you might want to fold a Senbazuru. This is a group of 1,000 paper cranes. According to Japanese tradition, folding a Senbazuru is said to grant you one wish or eternal good luck. The individual cranes are often strung along a string so they can be hung from the ceiling. The cranes are typically made from many different colors and patterns of paper, so they are a bright and cheerful decoration. The most common reason for folding 1,000 origami paper cranes is to show support for a loved one suffering from a serious illness. However, many nonprofit organizations have used the folding of 1,000 cranes as fundraising or public awareness tool. With a few small adaptations, the origami crane design can be folded from paper currency. You can find other variations of the crane project, such as a crane envelope and a crane bookmark, in our Origami Crane Variations article.